St. Rose of Lima is the patroness of Latin America and the Philippines. This South American Saint’s real name was Isabel, but she was such a beautiful baby that she was called Rose, and that name remained. As she grew older, she became more and more beautiful, and one day, her mother put a wreath of flowers on her head to show off her loveliness to friends. But Rose had no desire to be admired, for her heart had been given to Jesus. So she put a long pin into that wreath and it pierced her so deeply, that she had a hard time getting the wreath off afterward. Another time she became afraid that her beauty might be a temptation to someone, since people could not take their eyes off her. Therefore, she rubbed her face with pepper until it was all red and blistered. 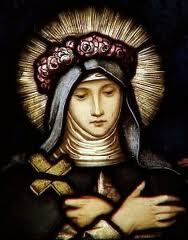 St. Rose worked hard to support her poor parentsand she humbly obeyed them, except when they tried to get her to marry. That she would not do. Her love of Jesus was so great that when she talked about Him, her face glowed and her eyes sparkled. Following her death at thirty-one, her funeral could not take place for days as the people of Lima thronged to see her body. She was buried in the cemetery of the Dominican convent. Later, as a number of miracles were attributed to her, her remains were moved to the church of San Domingo, where was laid to rest in a special chapel. Canonized as Santa Rosa de Lima, she is the patron saint of Lima, of Peru, indeed, all the Americas, Phillippines, India, florists, gardeners, and people ridiculed for their piety. She is symbolized by her love for the Holy Infant, roses, as a Dominican tertiery holding roses and as a Dominican tertiery accompanied by the Holy Infant. The celebration of her feast day in Lima is a particularly important one. Many miracles followed her death. She was beatifiedby Clement IX, in 1667, and canonized in 1671 by Clement X, the first American to be so honoured. Her feast is celebrated 23 of August. She is represented wearing a crown of roses.